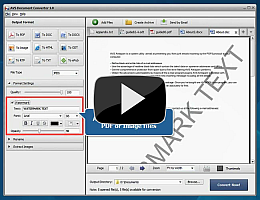 AVS Document Converter is an easy-to-use software application designed to view and convert various types of documents. It reads text files and converts them to PDF, DOC, DOCX, RTF, TXT, ODT, HTML, JPEG, TIFF and other formats. quickly rename a series of files to organize them later. To start AVS Document Converter go to Start menu and follow All Programs -> AVS4YOU -> Documents -> AVS Document Converter. How to convert DOC/DOCX files to PDF format? How to add watermark to your documents? What is in AVS Document Converter?